As a lover of classical music primarily but liturgical music, Gregorian Chant, Opera as well as popular music my tastes are eclectic. The thing I value most is clarity and the transmission of the recorded material without coloration as close as is technically possible. The worst thing a system would do for me is to make things fuzzy when they should be clear, to adulterate the sound to suit someone else's idea of what the material should sound like. 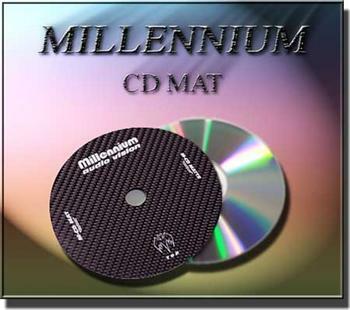 The Millennium CD mat is fantastic because it reveals more sonic material than I had heard before. I've listened to discs that are older and others that are very new. But I've listened to them all enough times to know what material is on them, and the Millennium CD mat from Aaudio Imports has blown me away. The Marigo mat made NO difference to my listening so I returned it. But Brian got me the disc in two days and I've been amazed at what I'm hearing on my well known discs. He's a gent, the disc is fantastic and at $119 makes my entire CD collection of over 1200 discs a re-found treasure. It also does for SACD's what it does for CDs. When I've used it with DVD's, I'm sure I'll find improvement.